Cooperate. Always Try. Do Your Best! Thoroughgood. Where Seagulls…Learn to Fly! 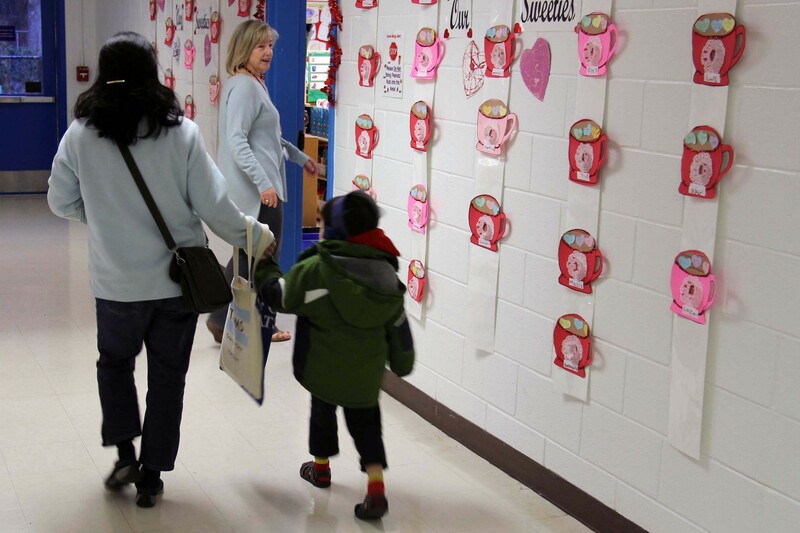 Encouraging words on hallway signs hang high above the heads of preschoolers walking hand-in-hand with their parents to room 33. 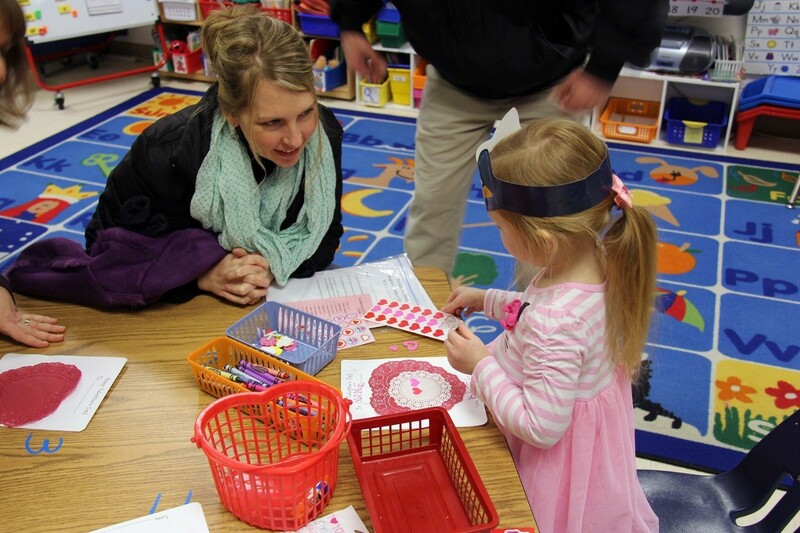 The future Seagulls are greeted by smiling Thoroughgood Elementary teachers and invited to find a seat on a colorful rug adorned with animals and other objects from A to Z.
Speech-language pathologist Kathy Scott leads families to kindergarten classrooms. “Why don’t you sit on the square with the zebra, Joey,” a teacher encourages, reading the nametag on the child’s paper headband. “And Wesley,” exclaims a voice from the floor. Wesley smiles broadly and adjusts his Pete the Cat crown. Kathy Scott, Thoroughgood’s speech-language pathologist, welcomes the group to the school’s kindergarten readiness program. It is designed to engage children and their parents in interactive learning activities focused on math, reading and technology in order to prepare children for the transition to kindergarten. To support this program, Scott was awarded an innovative learning grant from the Virginia Beach Education Foundation (VBEF). Reading specialist Annette Conley shows children the book they get to take home. As two dozen children made themselves comfortable on the classroom rug, Scott highlighted for parents various pamphlets and resources in a readiness packet they all received. “Phonemic awareness is important for early readers,” she stressed when referencing a document with early reading and writing tips. Scott then shared that each child would receive a free copy of the book, “Pete the Cat,” that they were about to read together. “It has stickers and a poster,” she said. “I can read it tonight?” an excited child asked loud enough for all to hear. 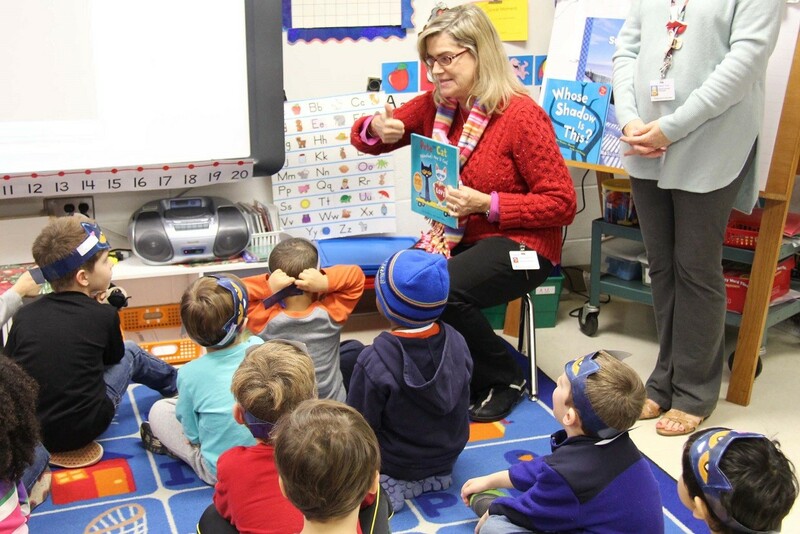 Attention turned to the classroom whiteboard as a cheerful recorded voice told the story of how Pete the Cat convinced a friend that Valentine’s Day “is cool.” Large, colorful pages flipped on the screen featuring Pete and his homemade cards for friends. Children used glue, stickers and crayons to make their own valentines. The whole group reading session was followed by small group activities in three kindergarten classrooms. In room 35, children counted and sorted candy hearts by color. Table 34 featured iPads for the pre-schoolers to try assorted apps. 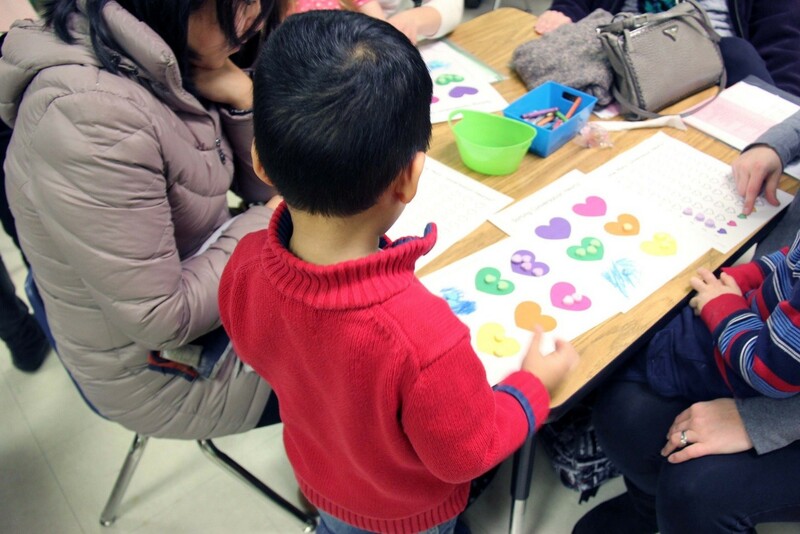 Children staying in room 33 worked with parents to make Valentine’s Day cards like Pete the Cat did for his special friends. “Can I get your picture?” asked one parent. No encouragement or direction is needed in room 34 as children whiz through iPad apps like digital natives. A math activity involved counting and sorting a bag of candy conversation hearts. Zigrang is especially looking forward to the final readiness session this spring because it will be a community outreach event held at the Bayville Park shelter. Engaging parents and children outside of the school setting is another opportunity to try to reach every preschool child in her school’s attendance zone. Scott and her Thoroughgood colleagues hope the skills the children practice in the one-hour session are extended to home and that the materials children receive will be used in future family interactions. She knows that school readiness is a partnership. Visit vbef.org to learn more about the Virginia Beach Education Foundation and the grants it awards to support innovative and creative learning programs.